Last week all across Canada, students started a new school year. Educators everywhere have been getting ready for that first bell to ring and for classrooms to fill up. In the spirit of kicking off a new year, we talked with teachers in several provinces who are empowering their students with Chromebooks and Google Apps. We discovered some really inspiring work going on, so we’re sharing a few of our favorite stories here with you. Grade four students Gabriel and Emily in Edmonton work on their e-portfolio sites. Bill MacKenzie is an Information Communication Technology Consultant for the Upper Grand District School Board just outside Toronto. 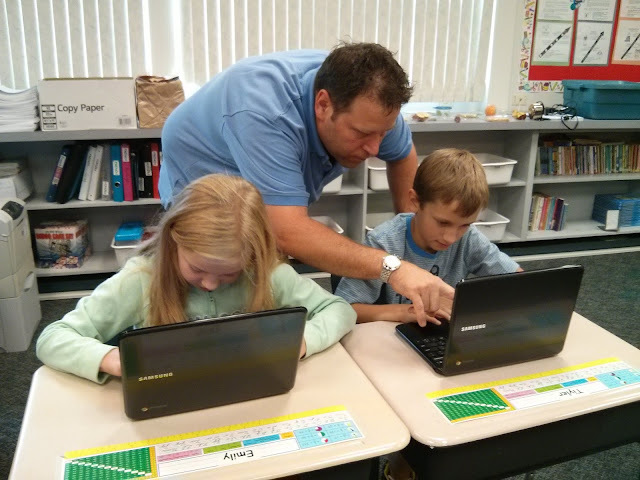 He first introduced Chromebooks and Google Apps to the district’s 34,000 students two years ago. In deciding between platforms, MacKenzie noted, “What’s different about Google is the collaborative piece. More than one student can work on a project at the same time and share their work with others in the classroom or across the globe. That’s an absolute game changer for us.” Currently, 4,000 shared Chromebooks are deployed throughout the district’s elementary, secondary, and high schools. We’re excited about what educators in Canada are doing with Google technology and can’t wait to share more about their and others’ work with you throughout this school year. To learn more about Chromebooks you can contact the Google Education Team through our website. Or learn from some educators: Scott Monahan and Jim Jamieson are Digital Literacy Resource Teachers for the York Region District School Board in Ontario. As part of their board's roll out of Google Apps for Education to over 120,000 users, the two have organized a “Google Camp” for more than 500 of their teachers next month; join their G+ community to get in on the conversation.